I would probably not call this as a side hustle; this can be very well a main income earner. Melyssa Griffin earns most of her online income from her courses. If you have expertise in any skill, then you can go ahead and create courses or e-books on that topic and start making money. There are many platforms which you can use to create courses like Udemy, Lynda or Teachable. Though it is slightly on the higher side for investment, Teachable is quite famous for creating the courses. Pet sitter is a fun side hustle which might probably not cost you anything. If you love animals, all the furry ones and hairy ones, then this side hustle is for you. You can look for online pet sitting jobs through websites like Rover, Pawshake, PetSleepover and much more. They even have an app to make things more convenient. You could earn around $1000 a month pet sitting according to their website. Blogging is one of my favorite hustles which I have tested since almost one year, and I have had great results. It is ultra cheap to start a blog, only $2.95 per month (remember this price is only through my link and for a short period of time!) and the potential for income is infinite. Plus you get a FREE domain when you sign up for a 12 month basic plan! I have been successfully earning over $4000 a month from my blog in just one year, and it is growing. So, if you have been thinking of starting a blog, either as a side hustle or as main business, this is the time. I have created a very detailed 5 day FREE course to help you start, so sign up today. This side hustle is quite close to my heart. I am a BIG photography junkie. But there is a money-making side to photography in a big way. You can monetize your photography skills in many ways, use your skills to become a brand ambassador on social media, become a freelance photographer, use apps like Foap, Snapwire to sell your photos. If you go towards the freelance way, you might need a website to promote your work. But all in all, it does not cost you much to make money from photography, you just need to hone your skills. This is very flexible and a great way to hustle without much investment. Freelance writers are in big demand right now. There are so many ways you can monetize your passion. You can write for magazines, blogs, media, etc. You can also start your own writing business and make six figures like Holly. There are many options you can choose from, check out this post which has many places where you can start your freelance writing career. Again, this is a side hustle or home business that does not take much to start off but the returns are great and entirely dependent on your efforts. Virtual assisting is so in high demand that most of the stay-at-home parents are opting for this hustle because of the flexibility. Check out how you can earn $35 per hour as a beginner virtual assistant. There are many virtual assistant companies which recruit VA even without much experience. Proofreading or editing is an excellent work-at-home option if you are great with correcting documents. Proofreading does require some prior experience, and you can start your own proofreading business with Proofreadanywhere. If you want to start freelance proofreading gig, then check out these companies that hire for editing and proofreading roles. Flipping is a fun way to buy things for cheap and sell them for profit. If you love shopping and have an eye for a great deal, then this might be a perfect hustle for you. You don’t have to spend much to become a flipper, but I would highly suggest Melissa’s Flipper university course, which can give you a lot of selling details and many useful tips. Did you know that professional organizing is in high demand? You might be thinking whether you need any special skills to become an organizer. No, you don’t need any special skills. Check out this interview that I had with Lisa Woodruff, who is an experienced professional organizer and has published books on organizing. It might give you a good idea on how to start this hustle. If you love traveling around your city, then you could start a fun side hustle as a tour guide. Being a tour guide is an excellent way to go around your city and give an awesome tour of the place to new tourists. This is a less explored side hustle but my friend Alexandra Kenin started off guiding tourists as a part-time option and now has a tour guiding company. As she mentions, there are not many costs involved in this hustle, and I am sure you can start with the least investment. If you have the travel bug like me, then this could be your hustle. Starting a side hustle is the smartest way to achieve financial stability. And to top it all, if you find hustles which require the least investment, then it works out for the best. 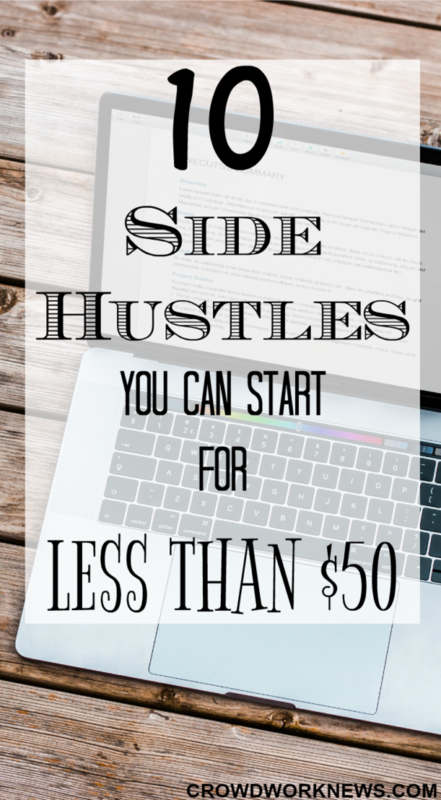 Start hustling with these side hustles and make money now.